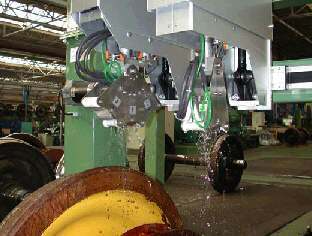 The up-to-now manual inspection of the axle of used railway wheel sets is substituted by an automatic system with phased array technique. 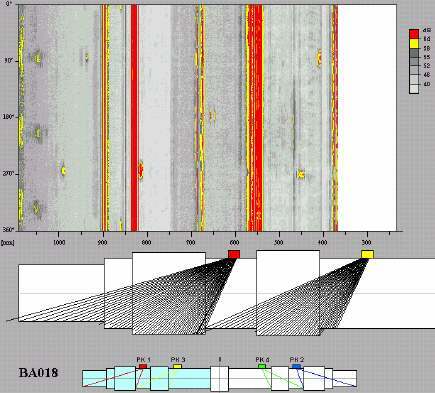 The phased array technique offers significant advantages like discrimination of real defects and indications caused by geometry and faster set-up of probe arrangements when changing the axle type, compared with conventional manual inspection. The increasing use of high speed trains in public transportation means higher stress to the components and materials used. Serious accidents in the past led to a demand for shorter inspection intervals, extended scope of inspection and more stringent test requirements to be applied to the critical components. All these requirements result in higher workload of the railway maintenance shops. One component, which is inspected in regular intervals, is the axle of the railway wheel set. Critical areas for cracks are mainly the wheel and brake disc seats and the cross section transition areas. The manual ultrasonic inspection of these used axles by experienced personal is time consuming (since several sound beam angles have to be used to cover the complete test area), expensive, and, of course, subjective. It represents a bottle neck in the inspection line. One way to overcome this bottle neck is the automation of the test process and the use of phased array probes. Fig 1:shows the block diagram of the system. 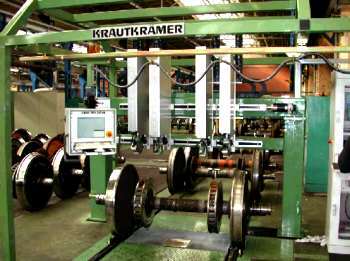 Krautkrämer, in co-operation with the German railways (DB) and the "Federal Institute for Materials Research and Testing" (BAM), developed a system to automate this inspection. This system applies the phased array technique to detect transversal cracks in the most critical areas of the axle. The heart of this new system is the COMPAS electronics with 64 channels. This electronics drives up to 4 or (optionally) 8 phased array probes. The 2.8 Mhz probe used here has 14 elements. The probe is mounted on a wedge which realises a zero angle of approx. 56 degrees. The resulting beam angle is shifted between 27 and 75 degrees in steps of 1°. Fig 2: principle of steering the sound beam of a phased array probe. The mechanics consists of a roll stand and a portal, which carries 4 independent control- lable probe manipulators. The inner manipulators can rotate by 180 degrees around their Z  axis, in order to enable testing in both axial direction (in case there is a third brake disc in the middle of the axle). For cycle time reasons, both sides of the axle are tested at the same time. The coupling areas between wheel and brake disc are narrow and, at some wheel set types they are limited by radii, so they require a special wear sole which matches these radii. Since there is no time for changing the wear sole we developed a special probe holder (revolver type) with 3 probes. This type of probe holder is shown in fig. 4. Fig 4: Probe manipulator, carrying 3 pha- sed array probes (A  C) The 3 cables are fed via a multi- plexer into the COMPAS system. The correct probe is then selected by the corresponding test parameter set of the wheel set All probes are of the same type, but the wear soles are different, in order to test the axles with different coupling area geometries. The used axle is often covered by dirt, grease and paint in different thicknesses. The array probe has a coupling area length of 54 mm. Over this length a constant coupling is needed, so we have to clean the surface in this area. The cleaning station, installed just in front of the test station, utilises a shotblasting process under vacuum conditions. After having passed the cleaning station, the wheelset is rolled into the roll stand. The operator enters the wheelset type number into the PC. By doing this, a parameter set, for the COMPAS UT system as well as also for the mechanics control, is called up. The control positions the 4 probes at the correct places automatically and the test procedure starts. The probes are coupled via a thin water film. After one prewetting revolution of the axle the first test rotation starts, all arrays are beaming "outside". The complete data is taken in one rotation. In case the axle has a third brake disc in the middle, the 2 inner arrays will be repositioned in axial direction and a 2nd test rotation with the inner arrays, now beaming inside (to the brake disc), is performed. One rotation lasts roughly 30 s, the cycle time (ground-to-ground) is in a range of 5 minutes per railway wheel set. During one complete rotation the digitized a scan data and the corresponding beam angles are stored on hard disk. 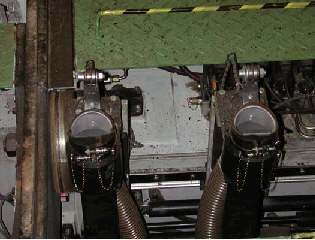 Simultaneously an online TD image for each probe is shown on the onsite monitor in order to control the coupling and correct function of the system. After completion of the rotation the COMPAS internal PC software reconstructs a "developed view image", a special version of the TD (Time displacement) image out of the stored raw data. This "TD image" represents a C-scan image, projected on the surface of the axle. Fig 6: TD  image. A scaled sketch of the tested axle type is faded in under the developed view, in order to enable the operator to easily discriminate between real defects and indications caused by the geometry of the axle. (Indications caused by geometry produce a straight line over the entire circumference of 360°). Real defects normally occur only over a certain section of the circumference. It is also possible to identify the axial position of the defect easily. The operator compares the image with the image of a defect free axle and decides about the classification (GO/NO GO). All data are collected in a data base and used for creating a history file of the wheel set. The ultrasonic system is calibrated using an axle with artificial defects on a regular base (beginning and end of each shift) or in case some components have been changed. The artificial defects are transversal saw cuts in the critical areas (2 mm depth). Shorter change over time when changing the axle type, since mechanical adjustment is substituted by software control of the probe angle. This is of great importance, since the batch size in the maintenance shop is "1", that means, it can be necessary to change test parameters for each axle. Comprehensive documentation possibilities of the test results, archiving of test data. Target for the future will be the development of software tools, which automatically evaluate the TD  images and generate the sorting signal, without human operator influence.